Last night my sister, Janelle, sent me an update on her hair progress (and I didn't even have to remind her :). It has been a bit less than a month and she seems to be sticking to her regimen so far. All is well, and she tells me that her hair feels softer, stronger and retains moisture longer. We have also discussed the idea of keeping up with her semi-permanent color by dying it again soon, but I figured it would be best to improve the hair's condition before coloring it again. Janelle is lucky enough to have a stylist that she trusts, so aside from the pre-poo all of these steps took place at a salon :). Pre-treat with coconut oil at home. Shampoo with Organix Moroccan argan oil shampoo. Towel dry hair until damp. 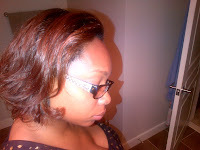 Apply Organic Root Stimulator Olive Oil Hair Masque (light protein deep conditioner). Sit for 5 minutes. Then sit under warm dryer for 10 minutes. Rinse. Apply Bee Mine Deja's Hair Milk. Seal with Sweet Almond Oil. Roller set, sit under dryer for roughly 40 minutes. Her one critique about this wash day was that perhaps she used too much almond oil, so her hair came out a bit heavier than desired. 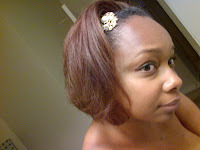 There's definitely a learning curve when it comes to how much oil to seal with to keep the hair from being heavy. Other than that, I think it came out great! When roller setting, moisturizing and sealing is only required a few days after the initial set. 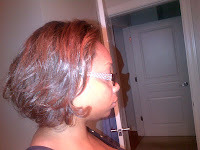 When air-dried and styled, moisturizing and sealing is required daily. 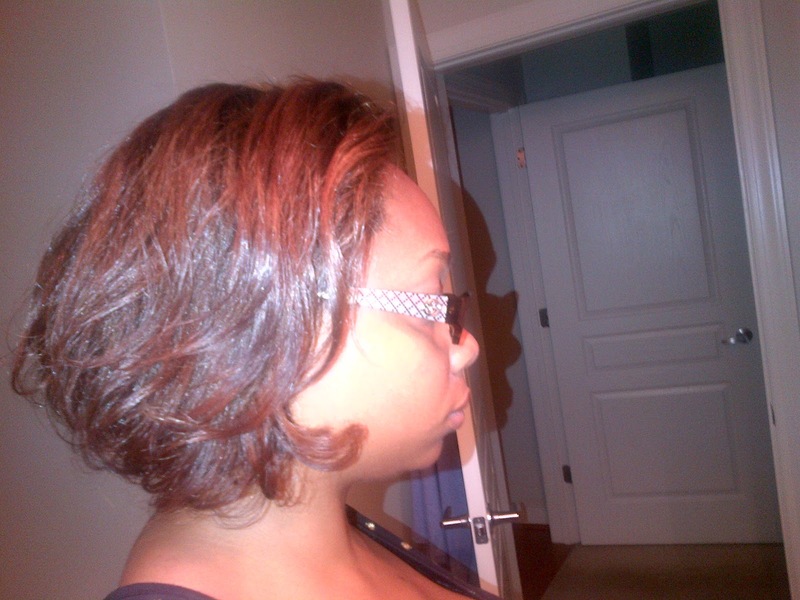 She also included a picture of her hair a few days after it was initially done. Thanks hun! You should, I've heard good things :).